Our summary at the close of the 2016 season was very much one of hope following a sterling effort to finish fourth despite the losses of high quality players. But pre-2017 season rumours of other players leaving Wide Lane, generally proved to be on the mark. Following on from the above losses we learned that Gareth Marshall, our top player would not be available for family reasons. Furthermore Adam Smith was to join Keighley in pursuit of a different challenge. Lewis Wrathall would be working and living in York for a year and so would play cricket in the local league. 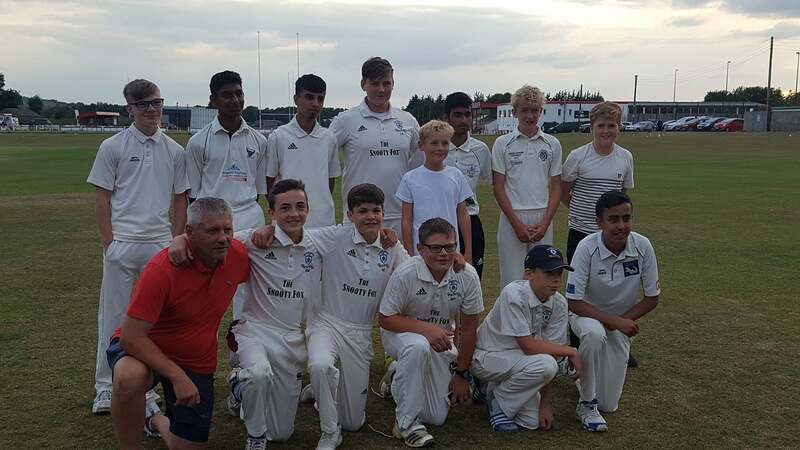 The losses of our rising young all-rounders Joel Fothergill and Hamzah Khan, who were both to join Oxenhope CC to play alongside a school-mate would be hard to bear. Jack Ellis too would not play as he was setting up home in Illingworth whilst availability of Nivard Trowers was also restrained by young family responsibilities. Ricky Linden and Matty Lee both had doubts about availability due to works demands. Sam Nettleton would for some reason, not be playing. Tariq Khan too was not available to play. Losses of 9-10 players threatened the divisional status of the team. Chairman Michael Scarborough and his selection committee were to be placed in a continuous battle to find 33 players each week to ensure the club maintained its CDCL top-flight presence. Alan Fothergill led the Second Xl but it was impossible to forecast at the season outset just exactly the squad would look like. Our sixth season in Division Two got underway against Long Lee 1st Xl with the team including no less than 5 junior players. James Lee led the batsmen with 34, backed up by 25 from Niall Saynor and a disappointing total of 119-9 was the final outturn, but the full 45 overs were utilised. Veteran Paul Stowell took a liking to our bowling attack and rattled off 74 from just 60 balls. At 118-0 Bilaal Khan snaffled a couple of wickets but Long Lee took the points by 8 wickets. The following week's journey to Sandy Lane was with a team strengthened by the inclusion of back-in-harness Joe Copperwaite. This week it was the other Khan, cousin Uwais Khan who grabbed the bowling headlines with 3-15 from 4 overs at 5th change. Unfortunately it was too late to restrict the home side who posted a daunting 213-7 with 48 from opener Rana Abbas. Joe added 34 runs and a stunning 32 from no 10 Bradley Powell made many sit up and notice. This week we totalled 150 in reply, another defeat but with a further 30 runs and 5 wickets over the previous match. At home again, Airedale were our visitors and they batted first, making mayhem against the team, which now included 6 juniors. They tallied 280-6, led by Asad Ejaz with 101 from only 55 balls and including 16 fours and 2 sixes. Opener Joel Clarke also chipped in 52 as the bowlers wilted. James Lee, Uwais and Bradley each too a brace, whilst Ollie Stell took the brunt from Ejaz. James really knuckled down and he reached 84 [12 x 4s & 2 x 6s] but only Paul Carter with 39 offered any real support. The total was 158-9 in just 31.4 overs. [Rohaan Jahangir did not bat due to illness]. Three matches and three defeats was perhaps understandable in light of the line-ups and a season of struggle was definitely on the cards. Two years ago the Second Xl celebrated a remarkable Championship win at Glusburn CC, our position this time was somewhat different. We batted first again with 6 juniors and Mark Pickles and Bryan Hollis, a little older took us apart with 6-31 and 4-28 in just 23.4 overs. Only James Lee with 13 reached double figures. Neil Freeman  and James Tillotson  needed just 11.4 overs to claim a 10-wicket win. Our first point of the season came the following week at Haworth Road lls as the weather prevented play. The first round of the Cowling Cup offered a Home tie with Barrowford lls and again the visitors batted first in the 20-20 competition. Half-centuries from both openers didn't augur well and the Lancastrians reached a titanic 180-4. Two wickets were claimed by Bradley Powell alongside 2 run-outs. Once again James Lee led the riposte with 41 with a pleasing 24no from Bilaal Khan after the result was beyond doubt. Oaks ended on 98-5 and out of the Cup. At home again we prepared to face promotion favourites Wilsden with 10 men. 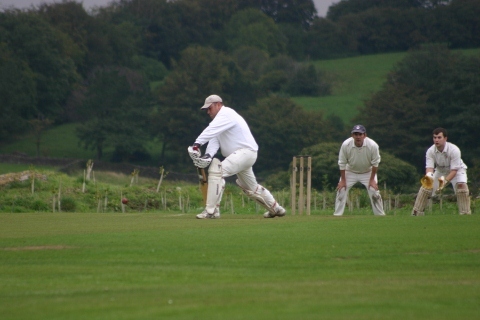 Wilsden opener Chris Mitchell had afield day with 141no [14 x 4s, 9 x 6s] from only 83 balls. Another 60 from Adil Mehmood helped the team total on to 260-5. Former Sandy Lane player Moin Ahsan made his first impact for Oaks with 3-50 from 8 overs amidst the carnage. There was to be no such performance from the batsmen who hung around for just 68 deliveries, accumulating just 40 runs. For Wilsden the wickets were taken by UAJCA juniors Sam Mitchell [4-19] and Harrison Houldsworth [4-13]. 5 defeats and 1 draw was already signalling likely relegation, seen as a blessing for 2018 at this early stage. Down the roads at neighbours Ingrow it was another former Sandy Lane player Aaron Pearce who hit the headlines with 4-10 in 7 very tidy overs. Sadly this was for the Ingrow side who contained Oaks at 102-9 in another 10-man turn-out. Matty Lee finally got into action and scored a patient 34 from 102 balls and again Bradley Powell showed his growing potential with 17. The [points were duly collected by the Ingrow boys, led supremely by opener and former Oaks junior Jake Hoyle with 69no. At home to Foulridge the weather again gifted us a second point. For the first time in 2017 Oaks bowled out the opposition, Ingrow St Johns, an excellent performance. The Johnnies scored 224 all out thanks to no 6 Sarum Qureshi 71. But the Oaks bowling took some of the applause with Ollie Stell leading the way with 3-30 ahead of the braces for Alan Fothergill, Uwais Khan and Ollie Bishop. The improvement didn't end there as 2 of our juniors Bilaal Khan  and Lucas Keslinke  carried us into a position where with a little luck we might actually win. Skipper Alan did his bit with 26no but the fall of Ollie Stell for 15 put paid to pour hopes and we concluded on a hugely creditable 203-8 despite the 5-44 from Qureshi. Chatburn came to Wide Lane and this time Oaks batted first, perhaps full of increased hope following last week's sterling efforts. Once again down to 10 men, that performance couldn't be matched despite 27 from Tom Fothergill. Veteran Johnny Lockley's 5-25 having posted 87-9. Zak Green with 45, steered the travellers to victory with 2 wickets down in 17.4 overs. The following week we headed for Cowling and amazingly had their first 3 batsmen back in the hutch for just 1 run between them! They recovered to 177 all out thanks to 51 from Liam Walker and 44 from no 10 Amjid Hussain. For Oaks the three former Sandy Lane boys were prominent; Moin Ahsan 3-29, Mohammed Ishtiaq 3-37 and Azah Riswah 2-32. As only Paul Carter can, he rattled up 65 as our opener but the loss of a string of wickets set us back to 104-7. But the tail certainly wagged. Steve Powell , Lucas Keslinke  and returnee Michael Thompson  pushed us closer and closer to the target. Last man Uwais Khan was on course for hero status but he was bowled by Shafait for 9 with pour total on 174 all out, agonisingly just 3 runs adrift. For the home team Martyn Dalby returned 4-29. The half-way stage was reached with 2 draws and 9 defeats. The return at Long Lee again failed to capitalise on the terrific play of the previous week. Lucas Keslinke was again top scorer but with only 10 runs in a poor 38 all out total. Credit has to be given to Steve Butterfield as the Long Lee bowler returned 6-21. Our innings lasted just 14 overs in our worst performance of the year to date. Uwais nicked a wicket but the match was all over after 11.3 overs, a match total of just 25.3 overs. At home we faced the prospect of trying to limit Sandy Lane but failed as their total was 282-9. Mukhtar Shah was their hero with 117 [105 balls] whilst Urfan ul-Haque smashed 51 from 31 balls at no 10. We shared the wickets with 2 each to Tom, Ollie B, Bradley and Uwais with a debut scalp for Henry Booth. Niall Saynor led our batting with 35 from 53 but steady wicket loss curtailed us at 95 all out including a fine 20 from roped-in Rob Wood! Earlier high scorers against Oaks, Airedale were next up at their middin. Chris Gill , Scott Ritchie  and Warren Coppack  ensured another high total. this time 241-8. Our bowling included 2-23 from Steve Powell. When did he last bowl? With the bat we fared much better but at 136 all out, were still well short of competitive. Paul Carter was top bat with 38 whilst Lucas Keslinke added another 21 to his year's work. At Glusburn we managed just 60 and only just exceeded that at Home with 78-9, courtesy of 31 from Bradley Powell. Mohammed Khan led the Glusburn attack with 3-11 and Neil Freeman again did his job with 47in their 79-2, both wickets to Tom Fothergill. Haworth Road ll enjoyed batting at Wide Lane, making a solid 213-8despite 3-22 from Uwais Khan and 3-66 from Tom Fothergill. They were indebted to Charlie Hainsworth  and Wajid Mahmood . Bradley Powell followed up with another 30 and back-from-Uni Ben Fothergill set out with 18 but Tom Kaznwski 5-20 proved irresistible in the Oakworth 82 all out. Expectations of a result at Wilsden were low as the Bingley side continued to top the Division. 259 all out was the home side's tally, Sam Holdsworth at the head of the card with 65. Off-spinner Tom Fothergill again shone with 3-68. Stevie Powell at no 5 added 45 to meagre total but only 99-9 was made in 33.5 overs. The 3-5 from 4 overs from Paul Kirby curbed any enhancement. At Wide Lane, former Oakworth junior Dan Scott fell short of his century with 97 in an Ingrow total of 256-7 in their bid for promotion to the top level. That hefty total came in spite of 4-54 from back-in-the-groove Tom Fothergill. Scott ripped out our first 3 wickets and ended with 4-25, Chris Herbert added 3-22 for good measure in our 38.1 over 127-9. Steve Powell again came up trumps with the bat to upstage son Bradley, with a sterling 65. The trick-track at Foulridge proved as difficult as ever at least for our boys. The Noyna lads had no problem stacking up 333-9, 158 coming from Muhammed Atiqueand 54 to Aamit Mohammed. Alan Fothergill picked up 3 wickets albeit for 87 runs in the onslaught. 19 runs fro Ollie Stell was the only innings of note in a dismal 37-8 in a 9-man effort of 12.4 overs. Chris Brooker-Carey with 4-5 really enjoyed the match. The next 3 weeks brought 5 points to our points tally with a draw with Chatburn, a concession by Ingrow St Johns [technically a win] and a further draw with Cowling. The league season ended with 1 win, 4 draws and 17 defeats; bringing 7 points with relegation a reality weeks ago. At Wide Lane we scored only 786 runs for the loss of 76 wickets in the 8 matches in which we batted. An average score of just 97 and batting form of 10.3 was certainly the form of a team in trouble. Our opponents scored 1,580 runs, losing 41 wickets. Only X teams were bowled out. The visitors average score from 8 innings was 197 with scoring at 38.5. Our visitors relished the productive Wide Lane strips as we captured around only 5.1 wickets in each match. Away from lush Oakworth pastures the story was: 1,001 runs scored in 9 innings for loss of 85 wickets. An average away score of 112 is not destined to find many wins at its end whilst losing 9.4 wickets each match produced a scoring rate of just 11.2 runs per wicket. Our hosts scored 1,656 runs and lost 56 wickets. Clearly their scoring on their patches was inferior with an average of 184 for the average loss of just 6.2 wickets. The hosts scoring was at 29.5 runs per wicket, significantly better than our batsmen, who got out far too often!! This year 10 of the 19 players appeared 10 or more times with under-15s Bradley and Uwais, leading the way with 20 and 18. Niall managed 17 matches just ahead of Ollie Stell & skipper Alan each on 16. Sill a junior Harry was called up 17 times. All in all 15 players were used during 2017, 8 of them still juniors. Topping the run-scoring in 2017 was precocious 18-year-old Jordan Powell with 466 with 1 century and 2 fifties to top the averages with 35.85. A real bonus was the reliable James Lee with a solid 196 and a best of 84 from 6 knocks before elevation to the First Xl. Next came old stager Steve Powell with 178 from 13 innings. Paul Carter racked up 166 at 20.75 from 8 times at the crease. 1 run further back came the best of the juniors Bradley Powell in 18 knocks [best 32], 5 of which were ducks. Reliable Niall Saynor, our usual opener tallied 142 in 13 innings with a best of 35. in a more subdued season. Matching Niall almost was u-15 Lucas Keslinke with 141 runs from his 13 innings. Tom Fothergill when available from Uni turned out 11 times and tallied 109, his best 27. Under-15 Bilaal Khan was on exactly 100 runs [8 innings] when he was called up to the First Xl. The bowling attack, as above suffered both at home and away. Tom Fothergill was top wicket-taker with 18 from 89 overs at 22.72 with a best of 4-54 and an acceptable economy of 4.6 for an off-spinner. Next came our own 'mystery spinner' Uwais Khan with 14 wickets at 27.86 and a marvellous strike rate of 22 [bowled just 52 overs]. At 15 he has plenty of time to bring his economy [7.4] down to improve his average considerably. Another youngster Bradley Powell was in third place with 12 wickets from his 69 overs but again with room for improvement in his economy of 6.8. Father and son Steve and Bradley Powell each managed 7 fielding victims with skipper Alan in 3rd place with 5. Lucas Keslinke picked up 6 keeping victims. For 2018 the club needs to see the team in Division Three when easier matches should pertain for the very young squad. The is currently little potential for promotions to the First Xl in 2018 whilst Bilaal Khan seems to have cemented his place in the senior squad already. However the experiences of 2017 will stand all the young players in great stead for future years with Lucas Keslinke, Bradley Powell and Uwais Khan already showing they can make it through to senior cricket. Of the senior players Alan, Steve Niall, Ollie Stell and Paul Carter should again be available. So the 2018 line-up could be Alan, Niall, Paul, Ollie S with Bradley, Lucas and Uwais as virtual certainties unless new recruits upset the balance. The squad will be completed but by whom cannot yet be clear, but both batting and bowling will need strengthening.